A social group for elderly residents in Keynsham is appealing for volunteers to step forward to help organise its busy programme of activities. KOPS – Keynsham Older People’s Social Group – meets on the first Tuesday of every month at Community @67 in Queens Road supported by Age UK B&NES. Members enjoy outings, such as trips to the Lifeskills Centre and MShed Museum in Bristol, Bath’s Holburne Museum, garden centres, as well as talks by visiting speakers, which have included representatives of Avon Wildlife Trust, Keynsham Photographic Society, Age UK and Willmott Dixon. 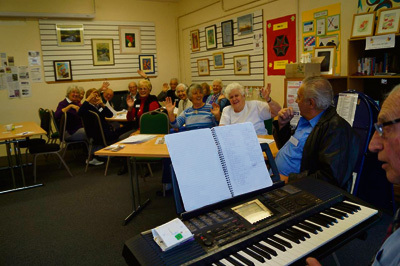 The group offers many more activities, and also runs a raffle and offers refreshments. Now Age UK B&NES is hoping to hear from people who could spare a few hours to help organise outings, arrange speakers, help with the raffle and refreshments and to offer general support to the members to help them run the group. One KOPS member, Pam, said: “I got involved with KOPS when I took two 90-year-old ladies who had been friends since school days, I stayed and really enjoyed myself and have been going along regularly since then. The ideal volunteer candidate should enjoy spending time with older people, live locally, be organised and enthusiastic and have a good sense of humour, say leaders at Age UK. To find out more about getting involved, contact Paula Smith on 01225 484510, email admin@ageukbanes.co.uk or visit www.ageukbanes.co.uk where you can find a description of the volunteer role. Age UK B&NES supports more than 12,000 elderly people, their families and their carers locally. Find out more about the services it provides by visiting the website above, find them on Facebook at www.facebook.com/AgeUkBathAndNorthEastSomerset or follow on Twitter @AgeUKBathNES.